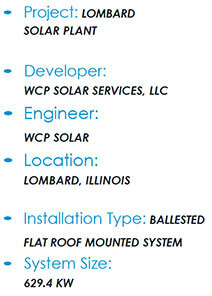 WCP Solar was contracted to design and construct a rooftop mounted solar system on two buildings hosting a Marketing and Real Estate investment firm located in Lombard, Illinois. This grid connected system ties directly into the ComEd utility’s power grid and generates enough electricity to provide power to more than the facilities electrical needs. Net Metering will allow for significant revenue generation. The project is sized at 629.4-kWp1, using 2,030 Photovoltaic panels rated at 310-W for the rooftop Solar system. The System employs 13 Solaredge string inverters and 984 P700 power optimizers appropriately sized to convert the DC energy produced by the solar plant into AC energy. In addition to providing significant energy savings, the solar system will produce significant revenue from selling approximately 793 Solar Renewable Energy Credits (SREC's) annually to the Illinois Power Agency, write off a 30% federal tax credit and through federal tax Modified Accelerated Cost Recovery System (MACRS) you can depreciate solar system in 5 years. It is estimated, that based on the incentives received, favorable inovative financing provided by Developer, and the energy savings being experienced, the system will be cash positive from day one with a very attactive return on investement (ROI) of less than 3 years. The Solar System is the largest rooftop Solar System in the West Suburbs of Chicago.